Want to eat a healthier (and delicious) version of lasagna? 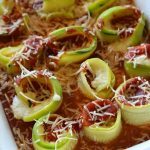 Try this zucchini noodle lasagna roll-ups recipe in your slow cooker (or your oven). You’ll be surprised at how you won’t even miss the noodles. In a medium bowl, mix the cream cheese, cottage cheese, mozzarella and Parmesan cheese together. Set aside. Bring a large pot of water to boil. You will only need 2 inches of water in the bottom of the wide pot. While water is heating up peel the zucchini. Cut the zucchini into long quarter inch strips. This is a little tricky but do your best. Place the long thin strips of zucchini, a few at a time, into the boiling water. Leave in the boiling water for 3 minutes and then remove. Do this with all the zucchini. Pour half of the spaghetti sauce in the bottom of a casserole crock or a 6 quart oval slow cooker and spread it around. Or if you’re baking in the oven spread the sauce in the bottom of a 9 x 13 inch pan. Spread some of the cheese mixture on the zucchini strips and then roll up the strips and place in the pan or slow cooker. Repeat until all the zucchini and cheese has been used. Pour the rest of the spaghetti sauce over the top of the zucchini roll ups. Cover the slow cooker and cook on HIGH for 2 hours or on LOW for 4 hours. Or if using the oven bake at 350 for 30 minutes. If desired, sprinkle with additional Parmesan and serve. I use my casserole crock slow cooker for this recipe.